With about 50,000 registrations at the beginning of the day on 16 June, the .BERLIN domain gained over 65,000 new registered domain names, ending the day with the total of more than 116,000 registrations. The massive number of registrations propelled .BERLIN back into the second position among the new gTLDs behind the controversial .XYZ with approximately 145,800 registrations as of 16 June. The .CLUB domain and the .GURU domain rank number three and four behind .BERLIN with 72,023 and 62,182 registrations respectively. These are the only four new generic TLDs with over 40,000 registrations. There are 11 gTLDs with more than 20,000 registrations, 25 with more than 10,000 and 115 with more than 1,000. Compared to the questionable activities of .XYZ domain registry that offered their registrants of .COM domain names the equivalent .XYZ domain unless they expressly opted out of the offer, the .BERLIN promotional campaign is a stark contrast. Gaining visibility may prove more and more difficult with so many as 302 new gTLDs approved for the release to the net. Some have not entered their Sunrise periods yet, let alone begun General Availability and there are hundreds more to become available. The .BERLIN promotional campaign has certainly given their registrations a lift! 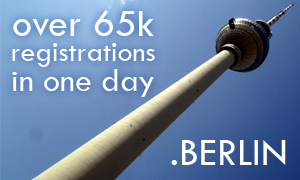 If you too want to register your .BERLIN domain name, click on the domain now. For more information, contact our Support Team at support@web-solutions.eu.